at a stunning historic artist's workshop downtown Munich. With a selcetion of our finest fingerfood in combination with a vernissage of fancy jewellery and abstract paintings. And a little Christmas surprise! Wine à la carte is available separately. The exact address will be given after the booking. Thanks for signing in until November 28th. Dress up in white, more or less elegant and enjoy an extraordinary dinner-event in a really charming location with us! Una Notta Italian, hopefully again in our charming garden! Get a taste of various aromatic spices from Africa to Asia, from chakalaka to 5 spices. We will rost and grind an Arabian baharat with your help. And we will serve you some yummy dishes with our favorite spices. Our location is a unique artit's workshop in the Glockenbachviertel. 45.-€ including welcome drink, mint tea, amuse-bouches and table water. Beer and wine à la carte is available separately. 45.-€ including welcome drink, amuse-bouches and table water. We kindly ask for a contribution to the artists performance. We are looking forward to our 3rd White Dinner in a stunning artist's workshop downtown Munich in the Glockenbach-Viertel. On the menu: a long white table with sparkling candlelights and a yummy autumn dinner for you! And one more thing: white dress would be lovely, but not obligatory! The new dinner dates for 2016 will follow. Hope you had great fun at the Oktoberfest! Due to the "Wiesen" we won't have our Pop-up Dinner in September. However we will cook a decent Bavarian menu in October, spiced up with some new and fresh ideas from Stefanie & Viola. So get a Taste of Bavaria! We are looking forward to our 3rd garden-dinner this year! 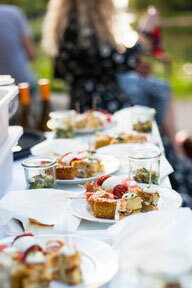 Yet our upcoming summer-event will be more sort of a garden party with a yummy buffet. On the menu: all sorts of vegetarian and mediterranean fingerfoods, fresh, hot, spicy, sweet... tasty. In case of rain we will serve a vegetable 5 course menu instead. In the mood for exotic smells like lemongrass, lime-leaves, ginger, coconut & co? So you are welcome to join our culinarian trip to the wonderful Thai-Cuisine. If the whether in fine, you may also enjoy a garden-dinner! Don't miss the Viktualienmarkt in May! There will be plenty of local, fresh products to taste. If you are not in the mood of cooking, enjoy a decent Bavarian beer in the beergarden and join our spring-dinner! Spring is hopefully ante portas. Before you leave for holidays you are welcome to enjoy our springlike Easter-Dinner. Wine and beer à la carte is available separately. Thanks for signing in until March 03th. Fed up with winter? In the mood for exotic smells like lemongrass, lime-leaves, ginger, coconut & co? Then join our culinarian trip to the wonderful Thai cuisine. After our long winter pause we are looking forward very much to spoiling you with a yummy dinner! Our 2nd White dinner in a stunning artist's workshop in the Glockenbachviertel will also be the last Pop-up Dinner this year. We sincerely apologize but unfortunately, we have many catering events before Christmas and we are also starting our new magical program at the Teamtheater (for those who prefer German, please see the German menu: Veranstaltungen "Geschichtenzauber & Gaumenschmauß). We are looking forward to setting our long white table accompanied with sparkling candlelight in the beautiful artist's workshop and to also cook a yummy autumn dinner for you! in the "Mercerie", a unique yarn store downtown in Neuhausen with fancy wool, yarn, cloth from all over the world, a little cafe - and for one night a Pop-up restaurant! Our first dinner in a stunning painter's workshop will be inspired by the exotic flavour of oriental spices. We will cook some of our favorite Moroccan recipes refined with a little "Taste of Stefanie & Viola". Summer in the city! Enjoy our summer buffet with homemade antipasti, tapas and more. Get a taste of 3 different native Italian olive oils from Latium, Calabria and Sicily. And you also can taste new exciting Spanish wines from the new vinothek "Camino del Vino". Cosi fan tutte, an Italian opera-dinner with Elizabeth Treat from New York and Rume Urano from Japan at the piano. This exclusive opera-dinner will take place in charming Secret-Supper-Club in the Glockenbachviertel. There is no dresscode, but nevertheless, an elegant dress is welcome to fit to the white candle-light-ambiance! Spring, Frühling, Primavera - what a season! No better season to enjoy fresh and reagional products. If this Italian weather will stay, we would love to invite you to our first garden-dinner. So keep your fingers crossed! We welcome you to spend your Easter dinner with us at the sculpture studio of Martin Spengler. Let us serve you a delicious five-course dinner amid enchanting sculptures and delicate reliefs of art. Come to our next pop-up dinner at a lovely photography studio! Relax and dine by candlelight with beautiful art filling your surroundings. We look forward to this new and very special location, where we will serve you classic French menu. For this secret supper event, we would like to invite you to dine in a new and charming location. The food in our menu will surely keep you from feeling the winter blues.